Have the rules changed regarding the fuel spec btween different teams? Afaik last year ferrari used some special fuel which they offered to haas and sauber, but both teams declined the offer because the fuel was too expensive. I guess that they do the same this year and hence the ferrari smells different to haas and sauber. Any reference to this? This is the first I hear about it. They don't have to use the same fuel. Renault uses Castrol, McLaren is Petrobras. mzso wrote: Any reference to this? This is the first I hear about it. I read this in a motorsport.com article last year. Iirc in the 2nd half of the season. Might have been gunther steiner who mentioned this, but im not 100% sure about him mentioning it. Yes, customer teams may use different fuel, but isnt the manufacturer forced (through rules or a technical directive) to at least offer identical engine specs to all customers? Also, hasnt mclaren postponed the petrobras swap? A customer supplied with an engine to be used with different fuel to that used by the engine supplier will have to be dyno tuned by the engine supplier using fuel the customer intends to use. Apart from this tuning being extra work and time for the supplier, it gives the supplier extra information of running the engine on different fuel to his regular supply. Also engines supplied tuned on different fuel to that used by the supplier is as regards the rules regarded as of the same specification as that of the engine dyno tuned to run on different fuel. As I understand it by now,McLaren has not started using Petrobras fuel yet. "Mercedes has observed a power explosion in the engine at Ferrari in Bahrain. Ferrari insists that air resistance (drag) plays a major role. Who is right? We asked around in both camps." "Team boss Toto Wolff put the proportion of air resistance at a maximum of one tenth. This would give three tenths of the engine power. His colleague Mattia Binotto thinks this is exaggerated: 'I looked at the Mercedes rear wing. They drove in Bahrain with clearly more downforce than we did.' For the Ferrari boss, air resistance therefore plays the decisive role." 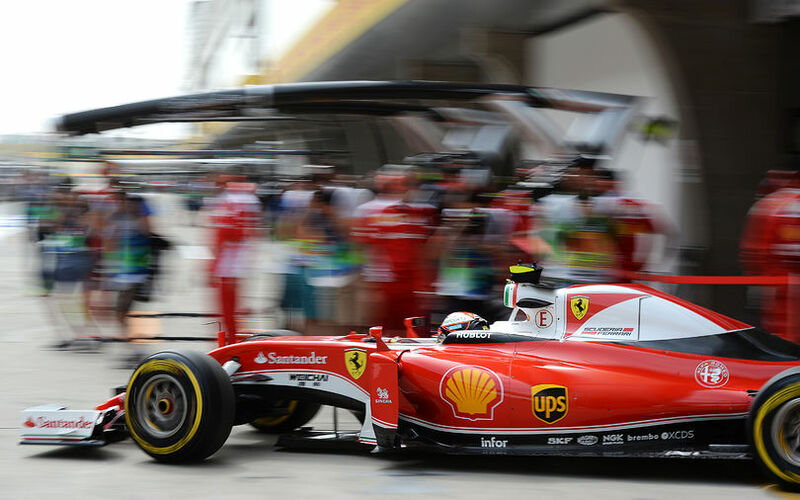 "Binotto also explains this by comparing Ferrari and its customer teams. HaasF1 did much worse on the straights than Sauber. The Swiss would have shown a very similar speed profile on the straights as the factory team. HaasF1 on the other hand lost six tenths. It is known from HaasF1 that they were on the road with a lot of downforce." "The Mercedes engineers don't want to be blinded by the theory of drag. 'Ferrari was much faster than us in both [DRS and non-DRS] conditions. That's why the drag factor couldn't have played a big role.'" ​"According to Mercedes, the difference between Ferrari and its customer teams can also be explained by the fact that the factory racing team drives with a different specification of petrol and oil. " "Mercedes wants to watch in Shanghai whether the pattern shown in Bahrain repeats itself on a completely different type of track. " Of course there is a huge amount of drag even when DRS is enabled, that why its called drag reduction system and not 0 drag system. Toto is too polititical, too much fog and deception for my taste. Remember the years RB dominated, they were always slow in speed traps but had superior down force. Its a design choice and why Mercedes is quicker in slow corners. Seems that both Ferrari cars used a new control electronics for China, as did both the Haas cars (FIA Document 7). Not sure what, if any, relevance that has to Bahrain issues. It was a precaution due to LEC electronics gremlin in Bahrain. Five out of the six FERRARI engine cars were using the old type of CE in China. Document 7 from the race, released by the technical delegate, show that VET, LEC, MAG, and GRO all took new CE and will start the event with it. As also did number 99 Alfa Romeo. They reverted to the old spec but had new units fitted so will have 1 old spec and 1 new spec for the season. This surely isn`t the Mclaren supplied unit which all the teams use [or is it?] as I was under the impression that was a standarized part which all teams must use. Seems that the latest McLaren/TAG powertrain control unit is the 320, maybe Ferrari introduced a newer unit ahead of schedule and it has some gremlins. Yeah, when I mentioned 'new', I was meaning new in regards to their allotment for the season as that is the only thing reported by the FIA. When it comes to the CE portion of the PU I have a tough time determining what it really is. Is it just the ECU, does it include the CU (K & H), what about the Injector Controller that was a problem last week or was the injector controller part of the ECU(?). McLaren did release the TAG-320B earlier this year. Not much, if anything mentioned about it other than this tweet. I don't know if it is mandatory or not. Also, I don't know which team are running it. GIO in the Alfa also had to take a 'new' CE for the race due to issues during qualifying. The following was replaced in parc fermé.